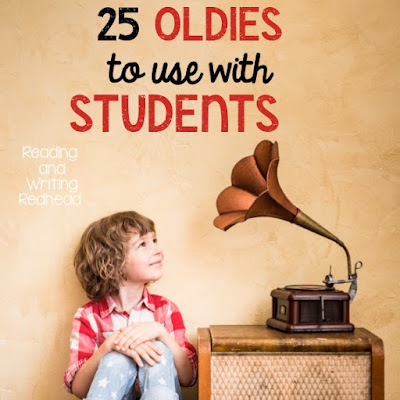 As a follow to my post on 25 Pop Songs to Use with Students, I thought you might like some suggestions for oldies or classic songs you can also use! I love music and it can make my day better and it can certainly change things up and keep things fun and interesting in the classroom. Here is how I chose the songs on this list? For the list of "classic" songs I considered songs at least 15 years old, and most from the 20th century. I checked out 60-70 songs I thought might be okay and then read the lyrics and decided what would make the top 25. If you'd like to read the lyrics yourself, try AZ Lyrics' website. Most of the songs, like most songs in music, are love songs, but can be interpreted in other ways or more general ways. I will post links to the videos for the songs so you can hear the song but I can not vouch for the videos themselves. If you need to find music videos that are okay for elementary students, please search through videos on your own. I am only vouching for the songs themselves. Please comment and let us know if you have any other songs that you think could have made the list! How can you go wrong? Of course this one has got to be a hit with teachers. "Reading and writing and 'rithmetic are the branches of the learning tree". I kind of forgot about this song but came across it in my research. This is not about someone else being your hero, but instead finding the hero is in you. That when you feel hopeless you can find the strength in you to carry on. Plus this is Mariah at her best - gorgeous, stunning voice and flawless (in my opinion) performance. Just a fun and happy song about celebrating, community, and dancing. Probably don't need to explain this one, but since it mentions love a lot, it might be "uncool" to older elementary school students but the younger kids would probably enjoy. Plus, who doesn't enjoy The Beatles? And I think of that wedding scene from the movie Love Actually with Andrew Lincoln, Chewitel Ejifor, and Keira Knightly with the surprise performance of this song. This is a great song by an amazing artist which would be great if you were celebrating music. Also I played this for my class after we read this picture book about Duke Ellington during Black History Month (clicking on the book cover will get you more details from Amazon). Most of you probably know this song already. It's just happy and fun and reminds me of the 1980s! Do you remember when it came out, or were you born after the 80's and only know it as "retro"? This is just such a sweet, positive song of hope. No need to explain it, right? Yes, this is a love song really, but I think it could be also thought of a celebration of any girl or woman: sister, daughter, friend, etc. This might be a fun song in October if you are talking about superstitions with your class such as black cats, walking under ladders, etc. "I hope you don't mind that I put down in words how wonderful life is with you in the world". This is a song you probably know but maybe you have not listened to the lyrics. It about appreciating the support of friends and knowing you don't have to go it alone. This is a show tune from the 1940's musical Carousel about never having to be alone and staying strong in tough times that was turned into a pop hit by the Merseybeat Band. It is VERY popular in Great Britain and often played and sung at football games. Your kids would probably not prefer this version but I feel like since it is the original it should get to be shared here! Google the song to find more recent covers. A cynic changes his attitude when he meets the right girl. Kids may not even notice the lyrics but they will probably enjoy the chorus. Of course they might recognize it from Smash Mouth's version from the movie Shrek! I remember some kind of Talent Show at my elementary school and someone was singing Simon ad Garfunkel. I don't know if it was this one but the lyrics of loyalty, support are sacrifice are timeless. Originally written by Bobby Darin, this song's theme is again about love and support. It has been covered countless time so even though I love this version you could find another one if you like. Watch out though, little Michael Jackson's gorgeous voice in this video makes me tear up, along with the sentiment of the song. So many terrific songs about loyalty and devotion. In this one, he does say "darling" a lot. It's a song that we probably all know, but our students may not. This video is a version by George Harrison but we love this song, right! Cheers me right up! A wonderful song about thinking positive, having triumphs after hard times and reminds us that things get better. Very inspirational lyrics and similar to Hero, he talks about finding strength in yourself. Your students won't know who he is, so if you feel it is acceptable to use, it might be great for elementary school classrooms. If you read the lyrics, there is a little innuendo, but elementary kids will not get it. Check them out before playing but I think it's okay for kids. Beautiful song about possibly losing a love that has made your life better. A song about remembering a past love - where? On Blueberry Hill of course. Written for the 2004 Sponge Bob (yes I know it's not 15 years old yet - I could not resist sneaking it in), it's a fun song that kids will totally relate to. Thank you so much for stopping by and checking out this list! 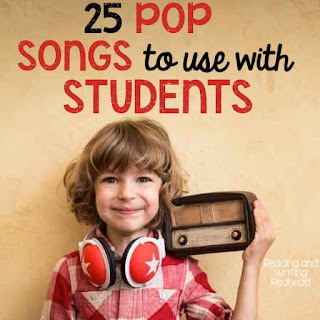 Comment with any additional ideas and be sure to check out my related post of 25 Pop Songs to Use with Students! Love it! Making a playlist for mornings and indoor recess. Thanks! Thanks Theresa-glad you enjoyed the list! Oh I love your page and everything you do Shelley! I am so excited you just stopped by never mind shared it! Thank you so much! Thank you so much for sharing these lists. I just spent time at a great conference and one of the speakers was talking about using music in the classroom and how to do it effectively. You have saved me tons of time and I can't wait to try these songs tomorrow with my first graders!